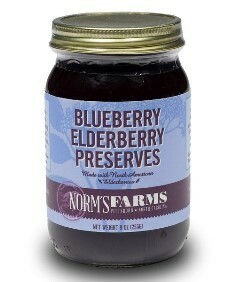 Norm's Farms found the tastiest North Carolina grown blueberries to feature in their new line of Preserves. Loaded with lots of whole blueberries and oh-so-good-for-you elderberries, these preserves are the perfect treat. And at only 8 grams of sugar per serving (the same as most fruit spreads), this is a treat you can afford!